Every year, Skills/Compétences Canada (SCC) hosts the Skills Canada National Competition (SCNC), an event that brings together the most talented young tradespeople in six sectors: construction, employment, information technology, manufacturing & engineering, services, and transportation. 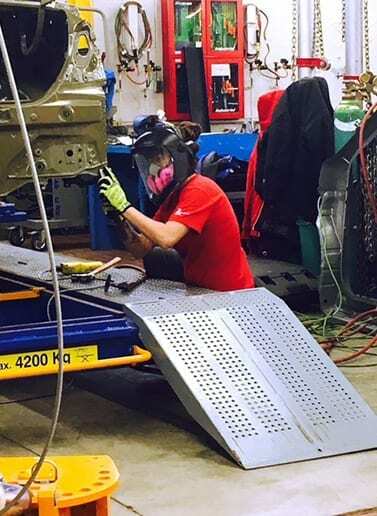 Vyolaine Dujmovic was an Autobody Repair competitor at SCNC 2016, which was held in in Moncton, New Brunswick. Vyolaine was among the 11.5% of female competitors in non-traditional trades. As a SCNC medalist, Vyolaine qualified to compete at WorldSkills Abu Dhabi 2017, where her skills will be tested against leading young tradespeople at the international level. SCC asked Vyolaine what kind of experience she’s looking forward to at the 44th WorldSkills Competition. “I’m really excited about going to WorldSkills because I believe it’ll be a very rewarding experience. It will certainly give me great visibility at the professional level. I know it’ll be a big challenge but I have trained for this. Even if I don’t win, I will be proud because I will give everything I have. Doing my best will also be an opportunity to show that women can excel in non-traditional trades. Of course, you need to have enough physical strength to work in these jobs but that is not an insurmountable obstacle. I hope I can help open doors for other women who might consider a career in the transportation sector, because there are all kinds of interesting career opportunities in this field,” she said. Vyolaine will take part in the 2017 Skills Canada National Competition, in Winnipeg, Manitoba, as a training opportunity. Join us in Winnipeg June 1st and 2nd. WorldSkills is open to the public and admission is free. It`s an excellent opportunity to see the best young tradespeople in Canada at work. For more information about the 2017 Skills Canada National Competition, go to skillscompetencescanada.com. After SCNC, Vyolaine will be competing as part of WorldSkills Team Canada 2017, at WorldSkills Abu Dhabi 2017, United Arab Emirates, October 14-19. This Competition provides a unique means of exchange and comparison of world-class competency standards in the industrial building and service sectors of the global economy. For more information, go to skillscompetencescanada.com. Vyolaine is grateful for the exceptional industry encouragement she has received from sponsors such as Car-O-Liner Group. Follow the progress of WorldSkills Team Canada 2017 on skillscompetencescanada.com, as well as on Twitter and Facebook.